The PH PLUS wall panel heaters from GABARRÓN are the ideal solution for warming a room extremely quickly occasionally or for short periods of time. They allow natural convection of the air to occur in the room. Cool air enters the lower part of the equipment and is warmed in the interior, thanks to finned, sleeved elements, so that warm air can be released later through the grille above. The warm air is then distributed evenly throughout the room. These finned sleeves allow heat dissipation in the room to occur much quicker than with other, conventional heating systems. Convectors are an excellent solution for many owners and constructors: they take up little space, are efficient and act quickly to achieve a swift and consistent cozy temperature. Apart from their use as an independent heating system, they are also used in combination with other electrical heating systems such as heat accumulators or electrical emitters. The new panel heaters use emitters and include the ETCO Electronic Control Optimizer, which manages and restricts the flow of electricity in the equipment. It relies on information provided by the thermostat and helps to avoid an unnecessary waste of energy. They are totally programmable on a daily and weekly basis and allow three temperature levels to be selected: Comfort, Economy and Frost Protection. 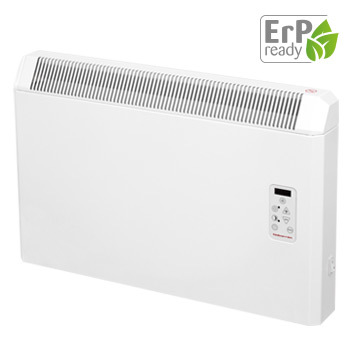 An innovation in the PH PLUS panel heaters is the inclusion of new functions which improve the performance of the convector, such as the “Open window detection function”, which switches off the heater for 30 minutes, after which it is switched back on in the corresponding mode and temperature level, so unnecessary waste is prevented. The function “Adaptive Start Control” is another innovation which allows adjustable starting, providing us with the desired temperature at just the time we want. It offers maximum comfort to the consumer. The PH PLUS panel heaters allow precise control over the temperature, as they have a built-in ambient thermostat, with a differential of ± 0.1ºC, so the room temperature can be kept at a level which suits the consumer’s needs. They are an ideal solution for use in rooms such as bedrooms, bathrooms, the kitchen and other areas. Apart from their use at home, they are also good options in offices and commercial premises. PH PLUS convectors operate silently, as they do not have internal ventilators. They do not require maintenance, are light and easy to install.